Obituary – Dolezal, Jack Allen « Perry High School Alumni Association, Inc.
– President of national honor society, vice-president of student council, vice-president of his sophomore, junior, and senior classes, and senior councilor of DeMolay are posts which Jack Allan Dolezal has held in establishing an unusual leadership record. Son of Mr. and Mrs. George Dolezal, 301 Birch, he has contributed largely to sports at Perry high school, also, serving as a football squadsman, 1942-43 basketball team captain, and winner of the 1942-43 Lions club basketball award. Dolezal has been a member of both the junior and senior honor societies and was cast both his junior and senior years in his class plays. Jack, a 17 year-old native of Perry, who received all his education in Perry schools, plans to join the air corps in coming months. 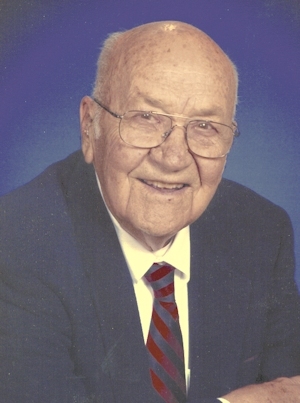 Jack Allen Dolezal, 90, life-long resident of the Perry community, passed away peacefully in his sleep on Friday, October 2, 2015 at his home. Arrangements have been entrusted to the care of Palmer Marler Carberry Funeral Home of Perry. A funeral service will be held at the First Christian Church in Perry on Monday, October 5, 2015 at 10:00 am. A reception celebrating his life will be held immediately following the service and all friends are invited. Burial will follow at a later time at Grace Hill Cemetery. Jack was the son of George W. and Margaret (McCoy) Dolezal and was born in Perry on July 12, 1925. He was a 1943 graduate of Perry High School and served his country in the United States Air Force during World War II. He earned an associate’s degree from Northern Oklahoma College in Tonkawa and had been an oilfield worker before joining his family’s abstract business, Noble County Abstract. A life-long abstractor, he had been a partner and manager of Powers Abstract. He had a remarkable memory of the Noble County land ownership records and loved “checking the records” for people. On December 21, 1946 he married the love of his life, Doris Charlene “Bow” Bowman, at Wellington, Kansas. Jack was a member of the First Christian Church where he was a deacon and elder and fixed the Sunday morning coffee. He was a proud member of the Perry Lions Club for 64 years, was an avid sports fan and a strong supporter of the Fellowship of Christian Athletes. Jack had served as president of the Perry Chamber of Commerce and was honored as Abstractor of the Year by the Oklahoma Land Title Association in 1993. He also was recognized as Perry’s Citizen of the Year in 1995 and had served as parade marshal of Perry’s Cherokee Strip Celebration. He served on the Board of Directors of Exchange Bank and Trust. Jack is survived by three sons, Gib Dolezal and his wife, Patti, Estes Park, Colorado, Mark Dolezal and his wife, Linda, Tulsa, Oklahoma, and Tim Dolezal and his wife, Debbie Hooper, Stillwater, Oklahoma; seven grandchildren, Luke Dolezal, Amber Koch, Jake Dolezal, Talia Hays, Casey Dolezal, Leslie Boley and Jordan Hooper; seven great-grandchildren, Fennel Koch, Indigo Koch, Mira Hays, Lydia Dolezal, Jack Dolezal II, Audrey Dolezal and Jaidyn Hooper; and one brother, Jim Dolezal, Perry, Oklahoma. Jack was preceded in death by his wife, Bow; one brother, George Dolezal Jr.; and sisters-in-laws, Sarah Lou Dolezal and Carol Dolezal. Memorials may be made to First Christian Church Abiding Memorial or to the Oklahoma Fellowship of Christian Athletes in care of Palmer Marler Funeral Home and may be taken in person to 203 East Fir Ave. in Perry or mailed to P.O. Box 189, Perry, OK 73077.